Updates to this article added below, with automatic 200MHz speed recognition arriving with BIOS 1.2, for the Xeon D-1541 only. I've been informed that this is unlikely to change, but any difference in speeds of any other Xeon D system are unlikely to be noticeable. When the Xeon D was first shipped last summer, those 2133MHz speeds were the champion of the entire Xeon product line. Nice perk for a next-gen, forward-thinking product line, especially given they're priced lower than most Xeon chip families. So I am assuming and hoping that this is temporary situation resolved by the next BIOS release. Perhaps it'll be called BIOS 1.1b, or more likely, BIOS 1.2. And it should be compatible with the Xeon D-1540, Xeon D-1541, and Xeon D-1587 systems that I've discussed in many TinkerTry articles. It should actually work on any Xeon D system or motherboard that Supermicro makes. I can't conclude much of anything yet, other than to say any marginal speed-up is likely to be only noticeable in some synthetic benchmarks. I don't have any 2400GHz RAM to test actually, and I'm not quite sure if systems with a mix of 2133GHz and 2400GHz RAM would behave happily at the lower 2133GHz speed the BIOS would choose, only hands-on testing would determine that for sure. Of course, it should work just fine. I don't currently have any loaners to try out for myself, and I'm certainly not going to lay down $700 just to see a miniscule speed boost. Cost was $350 USD last summer, more than double today's cost. Back then, 2400MHz was hard to find and cost quite a bit more. 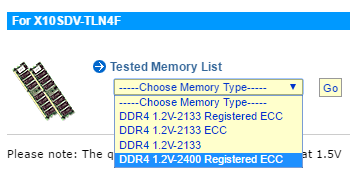 This same MEM-DR432L-SL01-ER24 is also available on Amazon and Newegg, but the prices there are currently considerably higher. Supermicro has acknowledged that they received my reports, but I don't yet have a status update ready. Intel specs do state 2400MHz support, which SebastianJ published in writing here. Wiredzone has confirmed that only the Xeon D-1541 supports 2400MHz memory speeds. Because 2133MHz memory has become rare, and sometimes costs more than 2400MHz, Wiredzone continues to ship all Supermicro SuperServer bundles with 2400MHz memory modules.